Mix together all ingredients until completely combined. Cover and then store in refrigerator for 1 hour to chill. Pour yogurt mixture into an ice cream maker and follow manufacturers directions. If you do not have an ice cream maker pour into covered container and place in freezer. The frozen yogurt will need at least 2 hours to freeze and set. 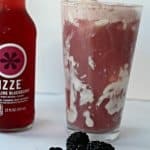 To make the Ice Cream Soda, place 2-3 scoops of Vanilla Bean Frozen Yogurt in a cup and pour 1 bottle of Izze Sparkling Blackberry over top.